Having friends that you enjoy being around and can trust is super important. It’s great when both friends care about and support each other. But sometimes friendships change or can be complicated or stressful. What can you do if a friendship feels confusing or you’re feeling left out? Why do people stop being friends sometimes if they still like each other and get along well? Friendships, just like people, come in many different shapes and sizes and can change over time. Sometimes a friendship changes because one person moves away, develops new interests or hobbies or maybe even because of a traumatic event. In a healthy friendship, both people should be able to support each other and talk about how they’re feeling. So if you’re not feeling like your friendship is healthy anymore, even though it can be difficult to stop being close to a good friend, it can help to talk about your feelings with that friend or a trusted adult. What do you do when one person wants to be friends and the other does not? This can be a really difficult and sometimes painful situation! Whether you’re the one who wants to continue the friendship or the one who wants to end a friendship, it can be hard to talk about these things without hurting another person or feeling hurt yourself. One important part of a healthy friendship is feeling like you’re both equals. So if one person is much more interested in the friendship than the other, it’s going to be difficult to have a healthy friendship. Talking with a trusted adult about these situations—how they make you feel and what to do about them—can be helpful. What are some good ways to talk about your feelings with your friends? A friend is someone who cares about and wants to support you. So if there’s something you want to talk about with your friend, keep in mind that your friend wants what’s best for you, even if talking about it is hard. To start the discussion, you can tell your friend that there is something you want to talk about. Find some quiet time to talk. It can help to practice what you want to say by yourself, either by writing it down or talking aloud. It can also help to talk with trusted adults who can share valuable experience or advice to help you through the situation. The bottom line is that healthy friendships include showing respect for each other and supporting each other, even though you may not always agree. Relationships, especially friendships, become increasingly important for young people as they develop from kids into young adults. It is developmentally appropriate for young people to seek more independence from their family and want to spend more time with their peers. They also might find that their friendships change, with some becoming more intense and others potentially fizzling out. These changes can be stressful and confusing for young people. It’s important that they understand that these changes are normal and it’s healthy to talk about your feelings with your friends and trusted adults. Peer pressure can play a major role in friendships and may be a sign of an unhealthy relationship that is out of balance. In a balanced relationship, each person shows respect for the other and neither tries to push the other into something they aren’t comfortable doing. It is important that young people know they have the right to stand up for what they believe is right and to feel comfortable expressing themselves with their friends. Standing up for oneself may cause tension in a friendship, but that is normal and not a sign of an unhealthy relationship. Have you noticed any of your friendships change over the past few years? It can be sad if a good friend becomes interested in new things and spends time with a new group of people. If that happened to someone you know, what advice would you give them? 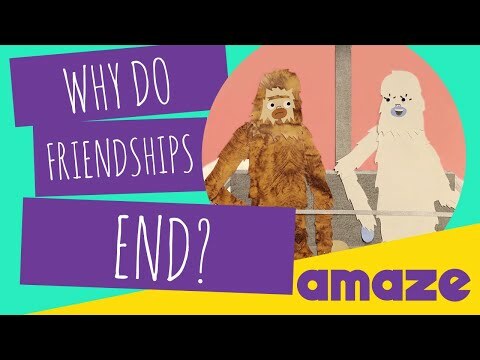 What does it mean when someone says, “Friends just grow apart”? Why does that sometimes happen? If someone feels like their good friend isn’t interested in the same stuff as they are anymore, what are some things that person can do?